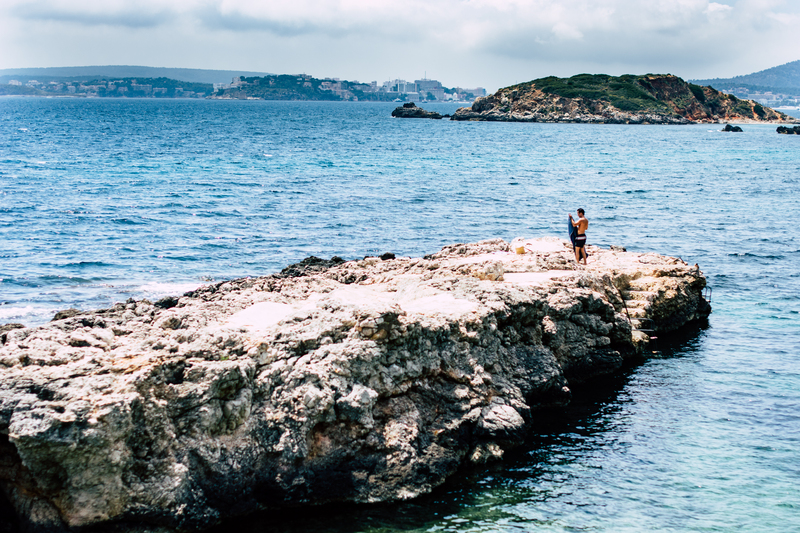 There is a lot more to the largest of the Balearic Islands than the bottomless fish bowls, streaking tourists and post apocalyptic street scenes of Magaluf. The rocky formation in the middle of the Mediterranean is one of the most popular holiday destinations for us Brits and our chums from Germany, with Palma International airport seeing nearly 30 million passengers pass through its doors in any given year. 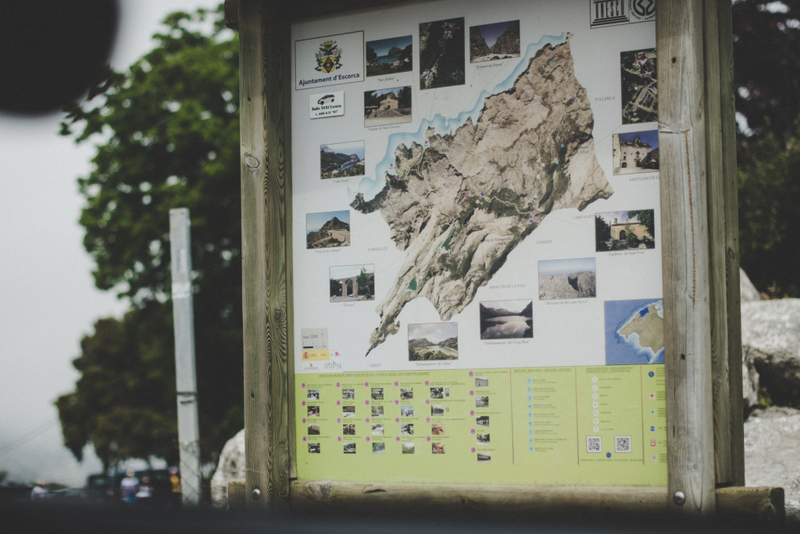 It’s also a mecca for cyclists, triathletes and fitness fanatics intent on tackling one of the hundreds of punishing climbs that snake their way across the north west of the island. But these tricky summits also act as the perfect canvas for an entertaining road trip, with myriad routes hugging the coast, cresting mountain tops and circumnavigating the 1,400 or so square miles of craggy landmass. 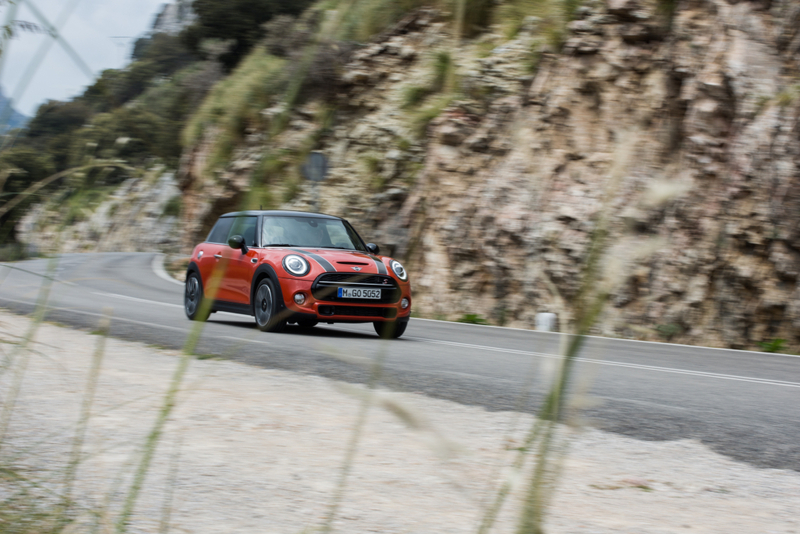 Mini knows the area well and has used Mallorca for a number of launches in its recent history, so it comes as no surprise that it chose said twisting routes to launch the mid-life update of its third generation vehicle. More of a styling exercise than a complete engineering overhaul, the 2018 Mini Cooper S – driven here – builds on an exceptional existing platform with a bunch of new personalisation options, some tweaked styling and the introduction of some new technology. The sheer scale of Palma airport always comes as a bit of surprise when visiting, but the nonchalant nature of the Spanish border guards means whisking through the vast expanse of steel, glass and concrete rarely takes much time. Outside the main building, a line of boxfresh Mini Cooper S models sits glistening in the sun, their Solaris Orange and Starlight Blue paintjobs soaking up the rays and dazzling bemused holidaymakers on the hunt for a taxi into town. The modern Mini has always been a handsome little number, finely treading a line between retro charm and contemporary chic, while offering a fantastic driving experience that pays homage to the original. 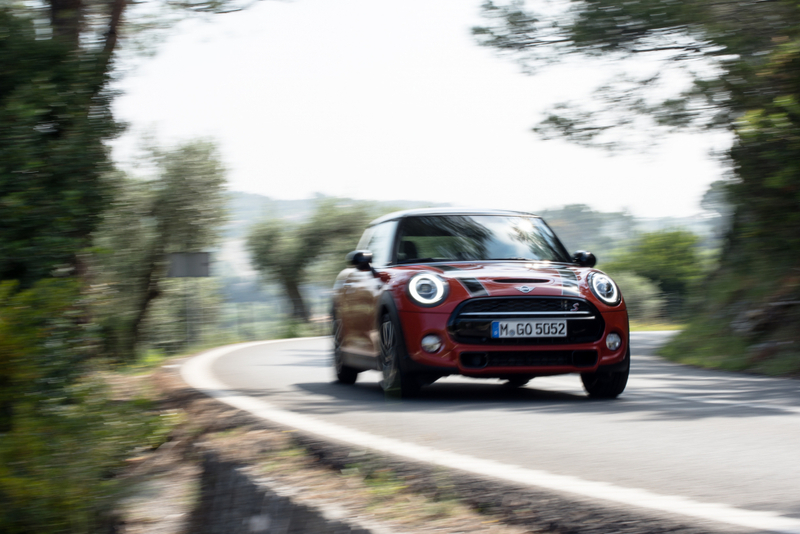 Now in its third generation, the Mini Cooper has grown considerably and now sports sharp lines, creases and flared arches that mean it can happily keep up with the models rolling off Seat, Audi and Volkswagen’s production lines. But in keeping with Mini’s desire to offer one of the most customisable and individual little hatchbacks on the market, it now boasts several touches that some could find a bit vulgar. 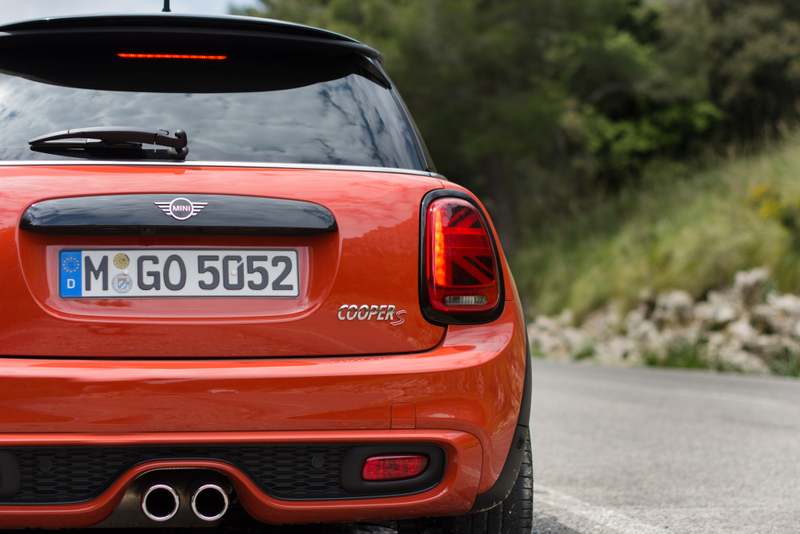 The rear lights sport a very obvious Union Jack, for a start, while small inserts can be ordered that sit on the dash, in the indicator lamps and on the front wing that can be specified with almost any text on them. Designed to host the owner’s name, for example, these little plaques are fashioned using the latest additive manufacturing process (read 3D printed) and can be fitted by the owner using some provided tools, which are also 3D printed. It’s a cute touch, and even the tread plates inside the door and illuminated puddle lights can play host to a bespoke message, but as my witty co-driver observed, it probably won’t be long until a brace of estate agents starts abusing the system for promotional gain. Nestled in the Portals Nous region of Mallorca, this beautiful restaurant and hotel sits perched atop a cliff that overlooks the Med. 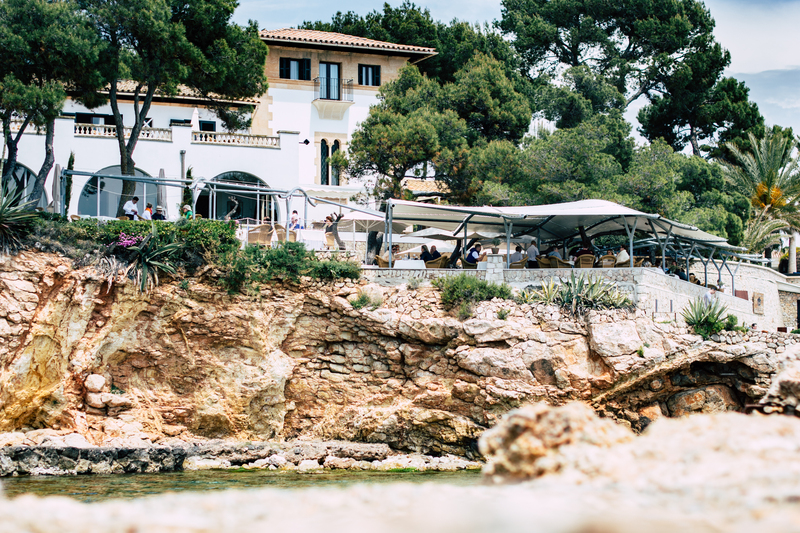 It is famed for its impressive sunsets, fresh seafood and extensive wine list, with the emphasis on fresh ingredients cooked with a fine dining twist. An impressive cocktail menu also makes it a great spot to hang out and catch up with friends, while numerous rocky outcrops beneath the hotel complex serve as phenomenal sunbathing spots, although there are some loungers for guests. Select some of the seafood dishes and you won’t be disappointed, while the freshly prepared paella is a firm favourite among regulars. 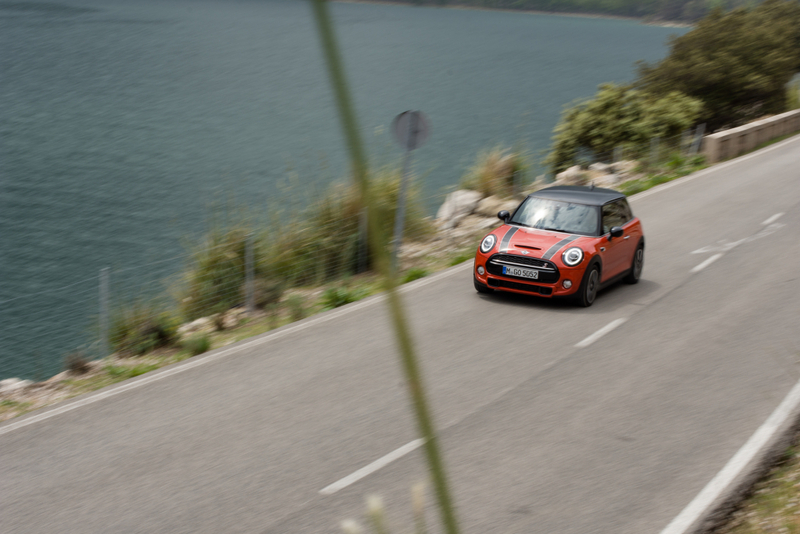 It’s almost instinctive to point one of the fieriest Minis in the range directly towards the most rewarding roads on Mallorca, so we immediately exit the airport and take Ma-1043, Ma-1016 and Ma-1031 towards Andratx and eventually onto the coastal Ma-10 towards the picturesque Estellencs. These early roads are narrow and twisting, with my attention evenly split between rounding 90-degree bends and not accidentally crossing paths with gaggles of hot, furious cyclists. It doesn’t take long for the Ma-1031 to start kicking up into steep sections of climbing tarmac, the road lined with Armco to stop slow-witted motorists from plummeting down into ravines below. The sights are immediately beautiful and the strong early May sunshine bounces off the valleys and illuminates the surprisingly lush foliage below. Although not immediately apparent, the famously fizzy 2.0-litre turbocharged four-cylinder engine has been revised slightly, with a new turbo, injectors and a fresh exhaust system helping to improve fuel efficiency. Power remains at 192hp and 300Nm of torque but it is enough to provide a truly entertaining drive, with the turbocharger working hard to ensure there’s plenty of shove from low revs. 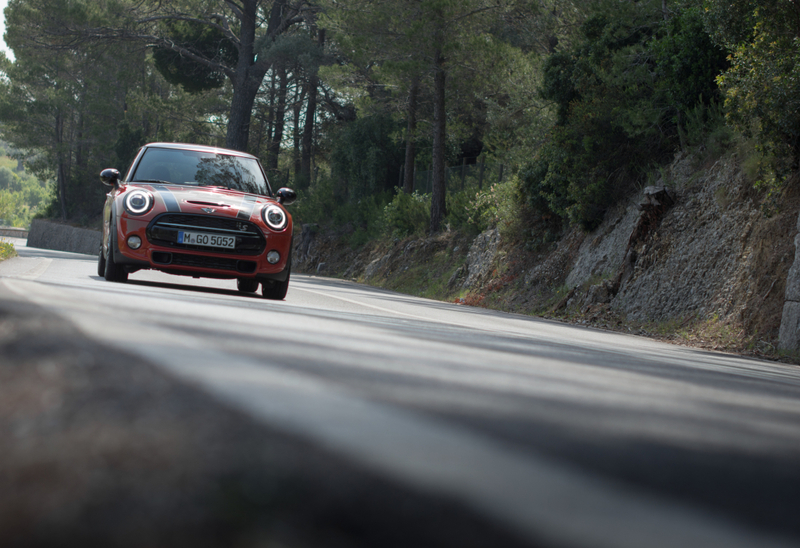 In typical Mini fashion, the steering is sharp and the suspension has been dialled in to favour big smiles through corners rather than long distance comfort. Although these test cars were fitted with trick dampers and offered several driving modes – the sportiest of which firms up the steering, sharpens the throttle response and stiffens the suspension. Thanks to Mallorca’s worst roads putting Britain’s finest to shame in terms of smoothness, I found myself opting for this mode more often that note, as it provided the most entertaining exhaust note, all cackles and pops on the overrun. 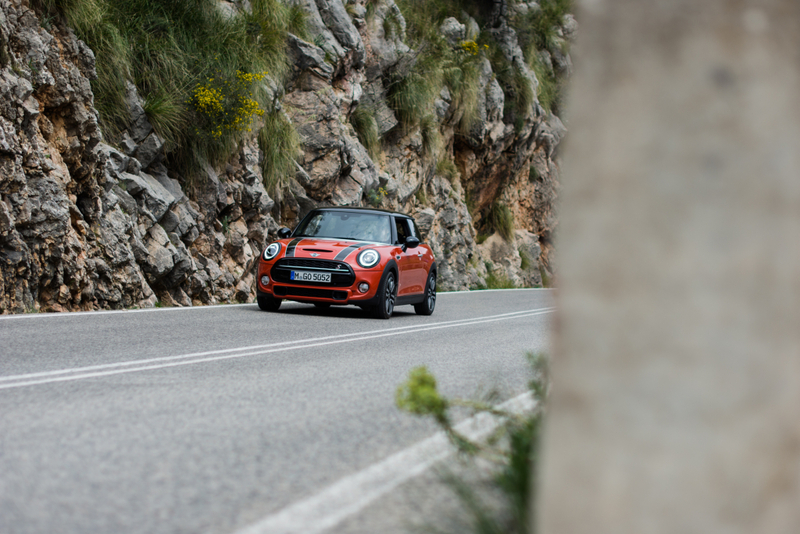 The Ma-10 opens up from the under the dense treeline cover and offers some of the finest views on the island, not to mention a series of switchback roads that could easily rival some of the finest in Europe when it comes to driveability. Despite a queasy co-pilot, I found it hard to refrain from slotting the excellent six-speed manual down a gear on entry to each of these tight corners, and burying the throttle upon exit to feel those rear tyres scrubbing for grip. The go-kart analogy is often overused when it comes to describing the Mini driving experience but it remains very apt to this day. 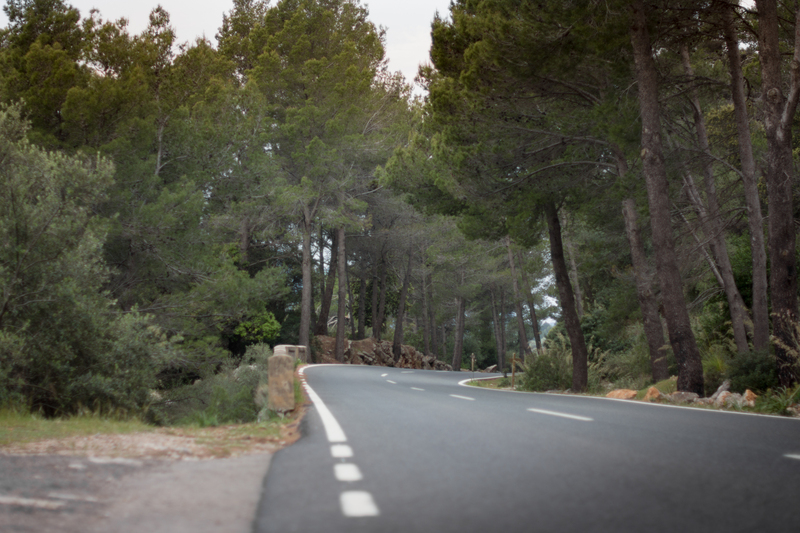 The run from our beautiful hotel (see sidebar) near Consell to Puig Major, the highest peak on the island, is only 50km but it can take in excess of an hour thanks to tight a twisting route that’s typically packed with cyclists. Get stuck behind a tubby lad in Lycra huffing his way up a seven per cent gradient and you may as well add another 30 minutes or so onto that journey. It’s a good excuse to check out some of the new technology that has been ushered in with this mild mid-life facelift and it includes a standard 6.5-inch infotainment screen that sits in the middle of the enormous circle where the speedometer one resided. 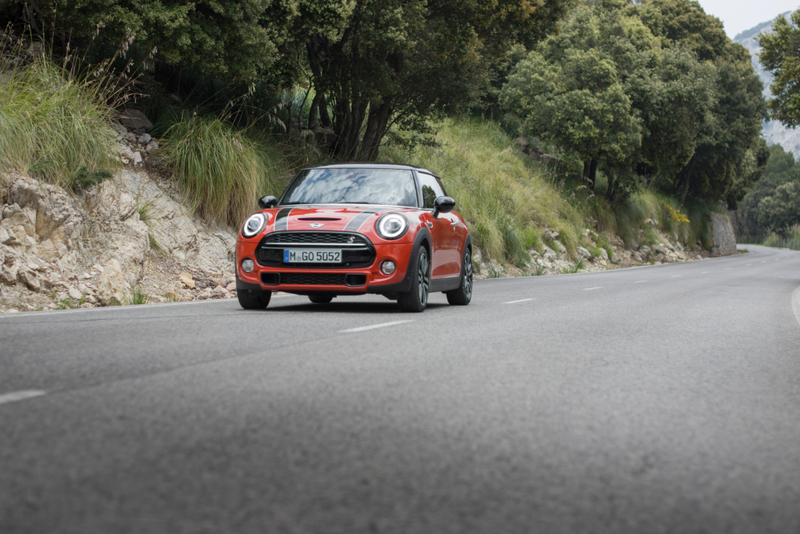 These Mini Cooper S models were kitted out with the larger 8.8-inch touchscreen systems that boast navigation, smartphone connectivity and numerous online services. This adult only boutique hotel is comprised of several traditional Possessió (farmhouses) that host a number of exclusive rooms, which go heavy on the exposed brickwork and wooden beams with a rustic and charming result. 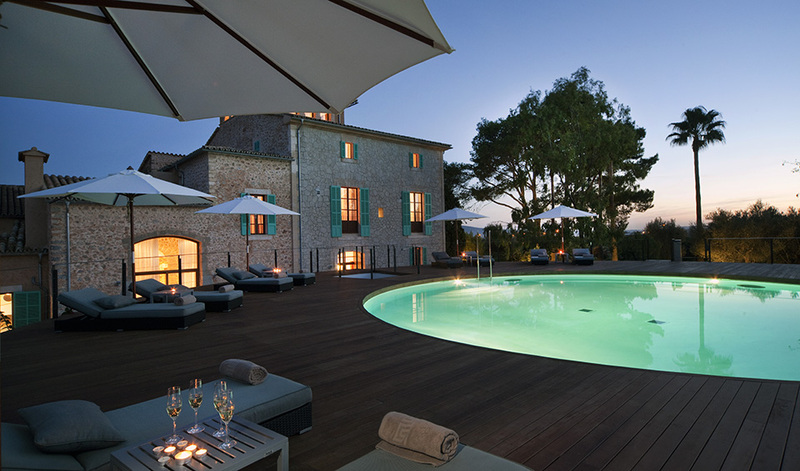 There’s a stunning circular pool in the centre of the external patio, which is raised high off the ground and houses an underground gym and spa complex beneath. The property itself has been around since 1578, while the surrounding fields have always been farmed. According to its current owners, the estate was a working farm up until recent years, with orchards of almond, carob and fig trees, wheat fields and vineyards. 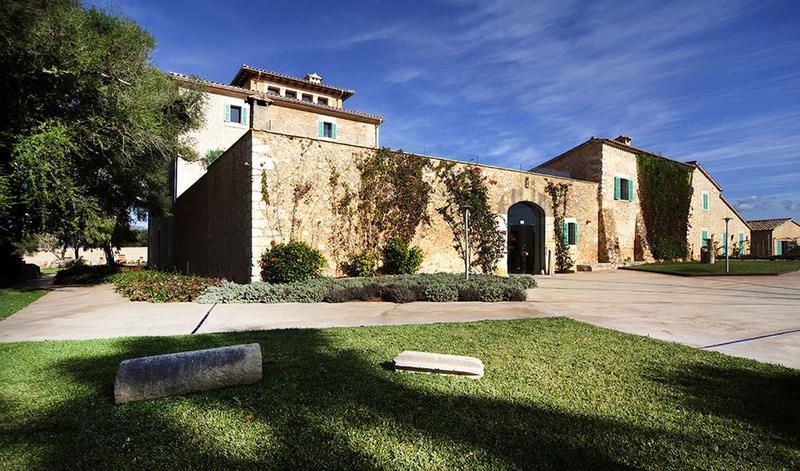 A major refurbishment project now sees it stand as one of the most charming hotels on the island, complete with impressive wine cellar. Rooms from €208 per night, visit hotelsacabana.com for more. Twirl the volume nob and a light bar that skirts the system illuminates in conjunction with the volume level, switch the driving mode and this same system fades from red to green. There’s a lot going on inside a modern Mini and it’s definitely a cabin that you either love or loathe, but it’ immensely comfortable and interacting with the BMW i-Drive-esque system soon becomes second nature. Also new with this generation is a set of optional adaptive ‘Matrix’ headlights that can be operated continuously on full beam at night, without worrying about blinding oncoming cars. It’s a similar system found on Audi, Volvo and a plethora of other premium brand models but adds a touch of tech that typically isn’t seen on this size of car. Throw in wireless phone charging, Apple CarPlay connectivity and some neat Mini apps and you have a pretty technologically accomplished little car. Being stuck behind pedal-powered transport is frustrating and the folk out on this particular day were among the angriest I’ve ever come across, but the views on offer at the summit of some of these climbs are spectacular. 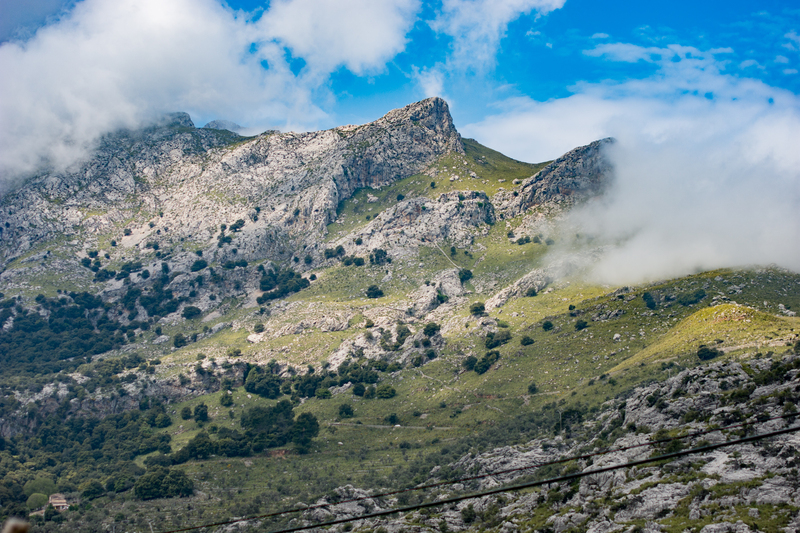 Luckily, the route soon snakes back down towards sea level and opens out into a stunning stretch that runs alongside the Gorg Blau Lake, before cranking its way up again towards Lluc. 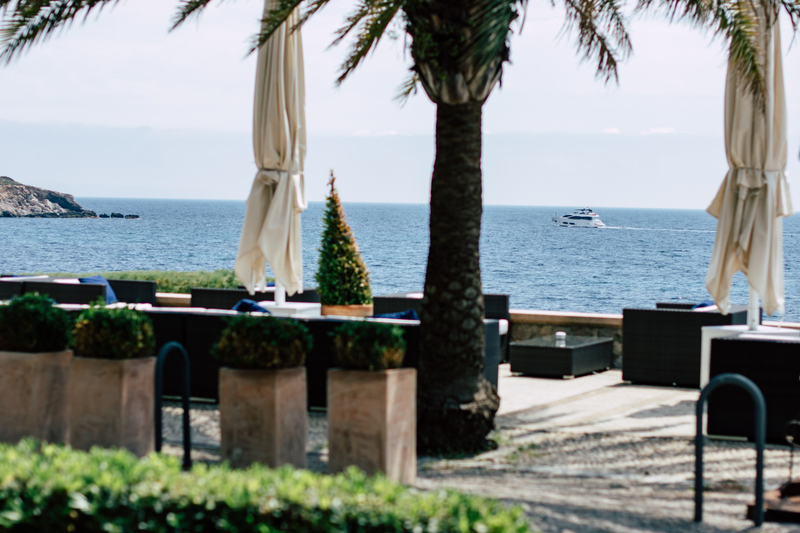 It’s very easy to spend all day up in the fresh mountain air, but a lunch date in the stunning Las Terrazas del Bendinat hotel (see sidebar) means we have to reduce the altitude and hit the main Ma-13 motorway back towards Palma and onto its surrounding coastline. Here, the water is crystalline clear and despite being a stone’s throw from the party capital of Magaluf, it couldn’t be further from the hen and stag-do mayhem. Yachts are moored in the azure bays, mahogany-skinned individuals dine on fresh seafood and bathers take advantage of the numerous rock formations that jut out into the waters. Despite the smattering of Porsches and Ferraris in this area, the latest Mini looks right at home in the seafront car park, its retina-singeing orange paintjob doing a good job of drawing admiring glances. 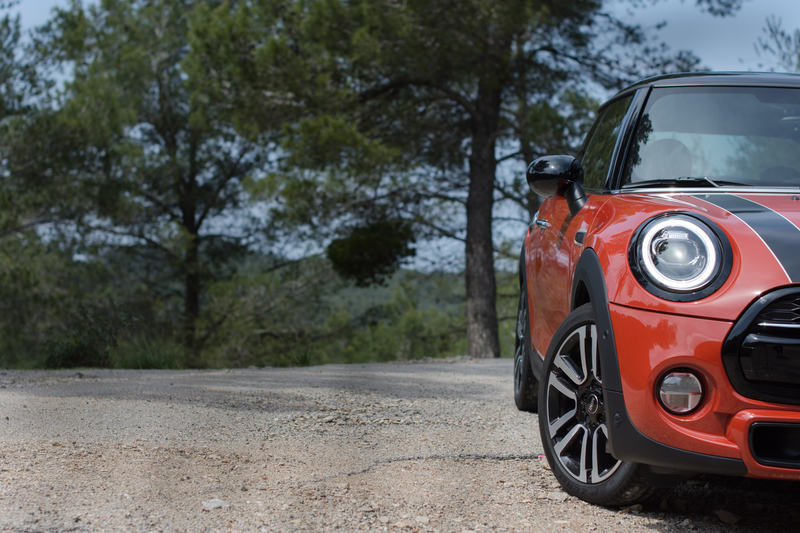 The mid-life refresh might be subtle but it’s proof that the latest Mini Cooper S still has what it takes to raise a smile on the right roads, even if it isn’t the most potent hot hatch on the market. It still impresses with its premium interior finish, light-hearted styling touches and a blend of thrills and refinement behind the wheel. 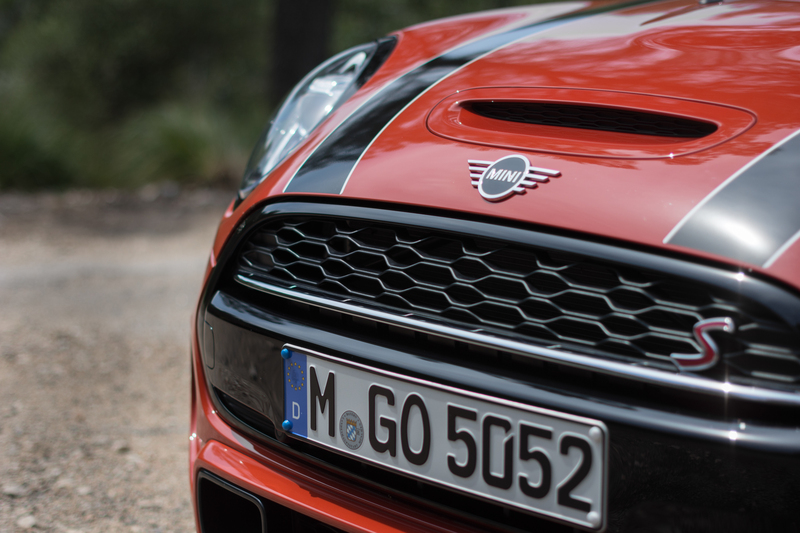 A car with a party-hard attitude and a serious side – much like the island its manufacturer chose to launch it on.